With the demand for coders so high, many companies have created websites with engaging and interactive experiences that are easier to complete than just reading a blog post or a book. Some sites gamify the experience, encouraging you to keep learning by earning points and badges. Most sites have community support, which can include discussion boards, live chat, or tutors to help when needed. The cost for these services varies per website; some are free and others charge a monthly or per‐course fee. When choosing a resource, check how much content is on the site, whether the materials are up‐to‐date, and the level of community engagement. Nothing beats having a strong online community to answer your questions quickly, and nothing is worse than spending hours trying to debug a problem with your code only to discover that the website you were using had a typo in the instructions. codecademy.com (free): Learn basic web programming languages to create complete websites from front end to back end. You can start immediately with only a web browser; you don’t have to download or installing any software. 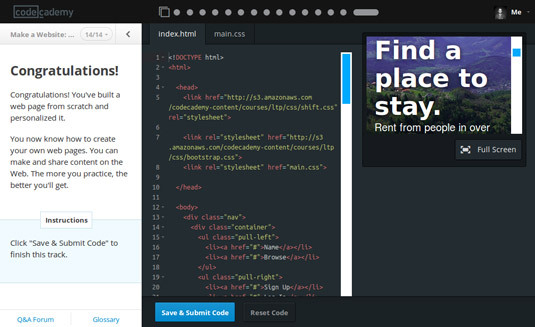 Codecademy helps you to build the Airbnb homepage. codeschool.com ($29/month): Initially, Code School became popular with its Rails for Zombies series, but the site also has a niche among intermediate developers. The site features video lessons with in‐browser coding challenges for a wide range of programming topics and languages. There are also screencasts (recoded coding sessions) with guest speakers teaching various skills. teamtreehouse.com ($25 or $45/month): Treehouse has a slightly larger content library than Code School, and includes all the usual front‐end and back‐end courses along with mobile app courses for iOS and Android as well as business classes on how to freelance and market your app or business. Bento is a community‐sourced curated listing of the best free resources for learning how to program and, most importantly, the order in which to take these topics to maximize your learning. The site has grown to include over 100 lessons on programming languages, frameworks, libraries, and APIs. Stanford’s Developing iOS 8 Apps (free): Stanford’s School of Engineering has released on iTunes an online course with over 20 hours of instruction and slides so you can learn to code apps for iPhones and iPads. Intro to iOS App Development by Udacity (free): Video lectures teach Swift programming by building an app that records your voice and then transforms it into Darth Vader or a chipmunk. Android and Swift Immersive by Bitfountain ($150): These two separate courses each have over 300 videos on developing iOS and Android apps. datasciencemasters.org (free): This open‐source data‐science curriculum has curated free and paid online courses, books, and tutorials. Introduction to Data Science (free): Hosted on Coursera, and taught by the University of Washington, this online course covers introductory big data concepts, along with data analysis and visualization. 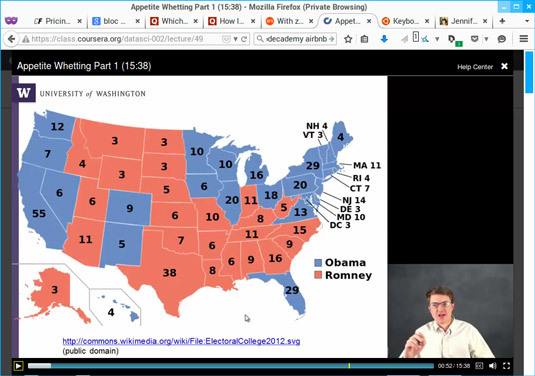 Coursera data science course analyzing 2012 presidential election data. datacamp.com (free to $25/month): This interactive online course teaches you R, a statistical programming language, in the browser. Courses include introductory lessons to advanced data manipulation and visualization using R and specialized libraries.